Every new character will receive strarter packages. Such quest abailable only 1 time: on main class or at the sub-class. Also it has level limit: 73 to 77 (if your character is level 78 - you will not be able to enter to Pailaka). Please note! Changes regarding bow. Your damage is now depend on the range to target. Changes is related to bow itself, not only to Archer classes. Added: Now all buffs that was added to summons before but was disabled - are now available. Summons: Feline Queen, Seraphim Unicorn, Nightshade. Now it makes the pet (not summons, like: Wolf, Kookaburra, etc) to attack its owner. It works regular (same as before) on summons. Attacks the enemy with mighty attack. Over-hit is possible. Now you have a chance to restore some MP with physical attacks. Has a chance to absorb 10% of the standard short-range physical damage inflicted on the enemy into MP at a certain rate of probability. Attacks the enemy with power attack, causes burns for 10 seconds, and makes him consume 43 HP every second. . Over-hit and Critical are possible. Cannot be used when a bow is equipped. Impacts the enemy with blunt weapon, decreasing the target's P. Def. and M. Def. by 10% for 3 seconds. Over-hit is possible. Increases P. Atk when using a sword/blunt weapon. Increases Shield Defense by 10% when using a shield. There's a chance that Collector's Fortune will be activated on yourself when using Crushing Strike. Passive skill, has a chance to buff trigger skill (Collector's Fortune) with 20% chance when you use Crushing Strike. Collector's Fortune: Increases P. Atk. by 15%, Critical Rate by 10%, Critical Damage by 10%, Atk. Spd. by 3%, and Speed by 5. Harness a mighty power to smite foes down with. Usable when a sword or blunt weapon is equipped. Ignores Shield Defense. Over-hit is possible. Regenerates 15% of Max HP and increases one's own Max HP by 15% for 10 minutes. Turns your rage into burning flames damaging enemies that surround you. Gives pure damage (non-attribute) to nearby limited amount of enemies. HP will be continuously consumed while in effect. Can be used on Grand Olympiad Games! Temple Knight and Paladin - can NOT used this skill on Grand Olympiad Games! Shillien Knight and Dark Avenger - can use this skill on Grand Olympiad Games! For 8 seconds, transfers magical damage back to the enemy caster. You can't transfer back more than your max HP counter. Inflicts non-attribute damage on nearby enemies and cancels their targets. Decreases your own PvP damage of magic skills by 5% for 5 seconds after the use. Power will be increased each times when you use Aura Flash again while under trigger effect. Aura Flare instantly decreases your own PvP Magic Damage for 50% on 3 sec. during PvP. Great concentration allows your to protect yourself with a magic shield to feel less pain. Turns 30% of received damage into MP Consumption for 10 seconds. When MP becomes 0 the skill's effect disappears. Changes regarding High Five chronicles: on HF it consume 70% of incoming damage into MP, instead of 30, as on Interlude Final. Increases critical damage by 30%. Requires a dagger. Now if you successfully use on pets (not summons, like: Wolf, Kookaburra, etc) - it will remove buffs from pet and disable Beast Soulshots/Beast Spiritshots/Blessed Beast Spiritshos. Uses the power of mighty thunder to increase the movement speed in exchange for your defending abilities. Duration: 15 seconds (for both levels). Now you can find special Runes that will increase incoming EXP and SP while your farming. You can find them at NPC Butler. Runes can stack with Premium Account and Clan Unity bonuses. Runes can not stack with each other. If you have both 30% and 50% Runes - you will enjoy the bonus of 50% Rune. If you have Runes of different levels - the highest Rune will work. Some new accessories going to be added in nearest future. Now enchantment sucsessful rate at level 79 and 80 is higher. For 30 seconds, 80% of the standard melee damage inflicted on the enemy is recovered as HP with a certain probability. Combines magic power increase and magic resistance increase to have more advanced magic ability increase effect. For 40 minutes, increases M. Atk. by 75% and M. Def. by 30%. Combines critical rate increase and critical power increase to have more advanced critical increase effect. For 40 minutes, increases critical rate by 30% and critical power by 35%. Combines Spd. increase and Evasion increase to have more advanced movement increase effect. For 40 minutes, increases moving speed by 33% and evasion by 4. Combines shield Def. rate increase and shield P. Def. increase to have more advanced shield ability increase effect. For 40 minutes, increases shield defense rate by 30% and shield P. Def. by 50%. Combines P. Atk. increase and P. Def. increase to have more advanced combat power increase effect. For 40 minutes, increases P. Atk. by 15% and P. Def. by 15%. Combines maximum HP increase and maximum MP increase to have more advanced mental and physical power. For 40 minutes, increases Max HP by 35% and Max MP by 35%. Active skill. Skill has cone-shaped hit area. Shoting arrow with energy of Phoenix, damaging everyone with 8049 Power in this area. Additionaly damaging targets during 10 sec. Critical hit is possible. Bow is requaired. Overhit is possible. Can be learned at level 78 for 24.000.000 SP. Active skill. Skill has radius hit area near the target. Shoting the rain of arrows, damaging everyone with 7043 Power in this area. Additionaly damaging targets during 10 sec. Critical hit is possible. Bow is requaired. Overhit is possible. Can be learned at level 78 уровне за 24.000.000 SP. Can be learned at level 78, for 24.000.000 SP. Instantly poisons enemy and decrease resistance to physical debuffs (success of such skills depends on COD parameter) by 15%. Duration of damaging part of the skill will remain the same. Combines a clan member's critical rate increase and critical power increase effects for a more advanced critical increase effect. For 40 minutes, increases critical rate by 30% and critical power by 35%. Combines the increased M. Atk. effect and M. Def. effect for a more advanced effect. For 20 minutes, increases nearby clan members' M. Atk. by 75% and M. Def. by 30%. Now will not occupy any buff slot. For 20 minutes, decreases the critical damage received by a party member by 10%. Can be learned at level 76, for 8.000.000 SP. Passive skill. When using Burning Chop your party members may be affected of battle madness. Buff Greater Fury not occupy any buff slot and last for 8 sec. Combines party members' general attack damage absorption and attack speed increase to have a more advanced blood awakening effect. For 40 minutes, increases Atk. Spd. by 33% and bestows the ability to recover as HP 9% of the standard short-range physical damage inflicted on the enemy. Combines party members' P. Atk. increase and P. Def. increase to have more advanced combat power increase effect. For 40 minutes, increases P. Atk. by 15% and P. Def. by 15%. Combines party members' critical rate increase and critical power increase to have more advanced critical increase effect. Increases critical rate by 30% and critical impact by 35%. When stamina is at its limit, sensation reaches its peak to increase evasion by 15 and chance to receive crit. damage when HP is below 30%. Can be learned at level 56, for 90.000 SP. Attacks the enemy by throwing a dagger with 3488 Power and decreases Speed by 50% for 10 seconds. Requires a dagger to be equipped. Can be learned at level 72, for 1.200.000 SP. Success of the skill depends on MEN parameter of the target. Now will additionaly slow target for 20% if success. In update 1.3 will have additional effect. Now will additionaly slow target for 10% if success. Instantly poisons enemy and decrease resistance to physical debuffs by 15%. Now will add a debuff targets that is under skill effect. Debuff will slow target for 10%, duration - 2 sec. Chance - 100%. Absorbs the target's energy. Energy can be absorbed with a 15% chance for regular physical attacks and 30% during a critical attack. Applies when a hand-to-hand combat weapon is equipped. When making a critical hit chance of getting +1 charge - 30%. Charges into the enemy which causes of loosing your own HP. Can be used while dagger, ancient sword, short sword is equipped. Can be learned at level 40 (skill level: 1) for33.000 SP. Chant of Protection - additional physical crit. resistance. Burning Rage - additional slow. +1 - +1% M. def. We are glad that you've read the full list of changes and you worth to receive some reward! Blessing of Revelations now can be Alt+click. Buffs can be received when certain period of Seven Signs. Skill will no longer provide +20% damage bonus when Bow is equipped. Gutz skill effect during the preperation part of the Olympiad games (before the fight) - he will not receive HP restoration from the Olympiad Manager. Now you can keep learning this skill after 2nd class transfer. Attacks the enemy using a shield and provokes the enemy. Requires a shield. Maximum skill level - 15. Last level when skill can be learned - 74. Panther Cancel - Cancels few enemy's buffs. Panther Dark Claw - Attacks the enemy and decreases tolerance for darkness attacks by 25 for 30 seconds. Panther Fatal Claw - Attempts a powerful deadly attack. Attacks the target with 3408 Power. Increases party members resistance to arrows for 50% and additionally decreases 50% receiving crit damage, however dance will decrease party members own PvP damage for 90%. Additionally increases MP Consumption when singing while song/dance is in effect. Requires a dualsword. Duration: 15 sec. Self Dance. For 2 minutes, increases your P. Def. by 25%, Evasion by 3, and M. Def. by 10%. Increases the additional MP consumption when singing while sing/dance effect lasts. Removes a party member's harmful abnormal status with 80% chance. For 2 minutes, increases resistance to de-buff attacks by 30% and the power of received HP recovery magic by 30%. For 2 minutes, increases the user's P. Atk. by 15%, critical power by 10%, and Atk. Spd. by 10%. Increases the additional MP consumption when singing while sing/dance effect lasts. Detonates a Fire Vortex to inflict fire damage on the enemy. Can be used on target that is under effect of Fire Vortex. Vortex effect will be removed after detonation. Detonates a Ice Vortex to inflict water damage on the enemy. Detonates a Wind Vortex to inflict wind damage on the enemy. From now on Epic jewelry will not only provide the resist to the negative effects, but also will boost the chance of its successful. Olympiad Warrior's earring. Limited-time item available for 7 days. It Has effects of MP + 31, Stun/mental attack resistance + 15%, Stun/Mental Atk. Rate + 5% and Vampiric Rage. Cannot be exchanged or dropped. When equipped with two identical earrings, the effect of only one earring will be applied. Olympiad Warrior's necklace. Limited time item available for 7 days. MP+ 42, Sleep/Paralysis/Stun Resistance Increases by 10%. Sleep/Paralysis/Stun Atk. Rate Increases by 5%. Decreased skill cooldown and damage shield effects. Cannot be exchanged or dropped. Olympiad jewelry has a limited time of use. It will disappear in 7 days after purchasing. Magician's Will - Increases M. Atk. by 5%, Casting Spd. by 5% and decreases MP Consumption by 5%. Fighter's Will - When using a short-range weapon, increases P. Atk. by 5% and Atk. Spd. by 5%, Physical skills and Dance/Songs MP consumption rate is decreased by 5%. Archer's Will - When a bow/crossbow is used, Accuracy increases by 8, range increases by 50 and speed by 5. Now: 60% - regular item, 35% - fail, 5% - rare item. Can be learned by all Mystic classes. Can be learned by all Fighter classes. To learn skill you will need to use Forgotten Scroll. 3 новых РБ в Silent Valley - drop 1 q-ty, randomly from all types. Due to the fact that some of the Epic Bosses respawn timer has been moved to very awkward time we've decided to change the respawn to more comfortable time for most of the players. It's 1 time conrection, which mean that next Baium is going to be killed at 20:30 - next resp is going to be from 18:45 to 21:45, in 5 days. At Sillent Valley fleding from the wrath of the gods the Fallen Giants, which have betrayed they brothers during the war with Mother of Dragons Shillien and been banished from Giant's Cave. At new location you will have a chance to complete the chain of quest to increase the level of trust with the race of Giants. From their side they will offer you exchange the proofs of killing the Fallen Giant on their knowledge. 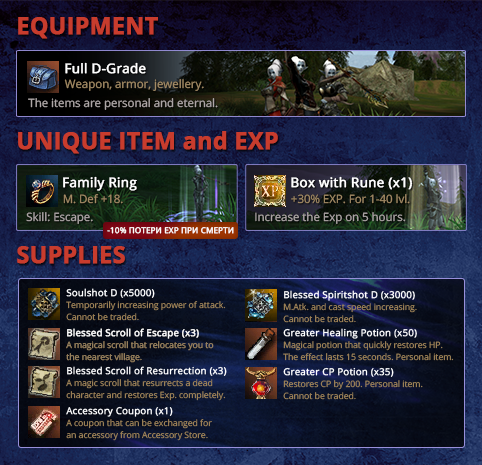 As the result of this trade you will receive the special breastplate for S-Grade armor, which will classify it, which will provide additional bonuses which was designed especially for you class. Draconic Leather Armor can be improved for your class (which have Light Armor Mastery), to receive a bonus which was designed especially for you class. Please note: after you will create a Archer Mastery on your armor, none of any other class will be allowed to put this part of armor. Requires a light armor to be equipped. + 20% chance, + 256 power. 70 level - 200.000 SP. Please note: it works on autoattack, not skills. It will help with a PvE aspect. Buff will not take a buff slot. Personal speed bonus +25, party speed bonus +15. Effect time - 30 sec. Personal attack speed bonus +15%, party attack speed bonus +10%. Effect time - 30 sec. 79 level - 10.000.000 adena and 20.000.000 SP. Personal physical skills damage bonus + 20%, party physical skills damage bonus + 15%. Effect time - 30 sec. Increasing outcome and decreasing income PvE damage. Duration: 20 min. Increased PvE damage by 20%, increasing PvE defence by 10%. 72 level - 700.000 SP. Can be learned on 40 level, 3000 SP. Can be learned on 76 level, 5.000.000 adena and 5.000.000 SP. +10% Resistance from defubb and cancel attacks. Each +1 level will increase speed by 1% (15% max). http://s39. *Ссылки на Radikal запрещены правилами проекта, используйте другие сервера. Такие как: screenshot.ru / joxi.ru *.ru/i086/1011/c5/12b15270402f.png Divine Punishment - Inflict divinity type damage on the enemy. http://s009. *Ссылки на Radikal запрещены правилами проекта, используйте другие сервера. Такие как: screenshot.ru / joxi.ru *.ru/i309/1011/df/a5886fed3c5a.png Divine Flash - Inflict mass divinity type damage on the enemies. http://s009. *Ссылки на Radikal запрещены правилами проекта, используйте другие сервера. Такие как: screenshot.ru / joxi.ru *.ru/i310/1011/2b/bb1161dc59da.png Divine Curse - Curse that decrease the effect of recovery magic by 50%. http://s53. *Ссылки на Radikal запрещены правилами проекта, используйте другие сервера. Такие как: screenshot.ru / joxi.ru *.ru/i140/1011/0c/b2e3e456d224.png Surrender to the Holy - Decreases the enemy's resistance to divinity type attacks. Can be learned on 76 level, 5.000.000 Adena and 6.000.000 SP. +25% Chance to avoid physical and magical skills (NEW). 15 targets, fixed cooldown - 3 min. 76 level - 15.000.000 adena and 5.000.000 SP. Successful rate has been increased. Be a Lord of a Castle. All clan members that will receive a Castle Passive Skill - +1 Con, +1 Men.